I think it has been forever that I got down to watch a movie on its release day. And that is not to say that I was so excited by the prospects of watching Bajrangi Bhaijaan on Day 1 that I broke the well-defined norms of parenthood. I went down to watch Baahubali (having heard people rave on and on about its scale and grandeur), and since there were no shows of Baahubali, or any other movie for that matter, I watched a significantly overpriced Bhaijaan. Overpriced has a definition here. Each ticket of PVR Gold Class was 800 bucks. Without any popcorn or cold-drink included in the ticket price. Why did I not turn back? Because I don’t do that. No, I don’t. And if I try to, the missus does not let me do that. Not when movie watching events with just the two of us have become so preciousssss. The movie is about a mute girl from Pakistani who finds herself stranded in India, only to be rescued by Bajrangi Bhaijaan, urf Pavan Kumar Chaturvedi, a naïve lad from Pratapgarh, who lives in Delhi, but finds the girl in Kurukshetra. Bhaijaan promptly decides that it is his duty to take the girl back to Pakistan, against all odds, and help her unite with her parents. Can you imagine the hand pump sized opportunities here? A Pakistan full of stereotypes, an army full of good for nothing soldiers, an occasional world-unifying-Muslim-with-a-heart-of-gold, and Bajrangi Bhaijaan going “Hulk Smash” on them? The number of grey haired preachy sermons being delivered to tikka and akshat wearing nincompoops? It does not happen that way. Read the rest of the review with the sarcasmometer aside. The movie is fairly heart-warming. But for the last 15-20 minutes, its reasonably well-toned and not over the top. The kid-Bhaijaan equation is not full of melodrama. In fact, it’s lovably cute. In fact, it is this that makes the movie very very warm. It’s not a typical Salman movie. [Spoiler alert]: Salman does not bare it all this time. There is a total of 2 minutes of serious Salman kinda violence in the movie at the end of which one guy is found hanging by the electric wires of purani dilli, and a policeman in Chawra, Pakistan is seen nursing his neck and apologising for letting a jasoos escape. Few broken tables and a few broken glass doors. That’s all. Salman tries to act this time, and not play Thalaivar. And for most of the movie, gets it right. By his sheer charm, not by his acting skills. 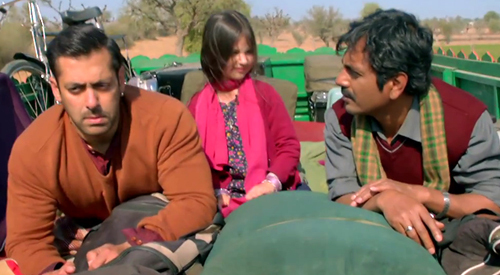 There is something about his chemistry with Shahida (the kid, Harshaali). Their scenes together are almost perfect. Shahida, by the way, without a dialogue, is so awesomely perfect and cute in this movie that even before she is stranded in Pakistan, you start waiting for her to cheer for Pakistan Team. She is not just a cute prop. It is she who really elevates the movie to being a genuinely lovable movie. I can safely imagine quite a few tears being shed across the theatre, so heart-breaking her pain is in quite a few scenes. On second thoughts, it’s good that she does not have dialogues. Most adult script writers don’t get kiddy dialogues right. They make them either too cute or too preachy. Kareena Kapoor Khan is an unrequired prop in the movie. She provides enough support to the emotions of the movie, and her eyes still light up the best in the industry. Nawazuddin Siddiqui. You were waiting to hear about him, right? I think Nawaz confessed in an interview somewhere that commercial movies help pay the bills better than the movies with great scripts and direction. Nawaz is spot on. He more or less always is, these days. He pulls off that “Eid mein Karachi se andruni mulkon ki” video copy. Interestingly, his character is named Chand Nawab (just as it was in the original video here). I was so hoping that they allow him to swear freely, but I guess censor board would not have liked it. In a way, he owns the screens when he is there. And he may just have the problem that Irrfan Khan had some time back. He overshadows the “superstars” too easily. The only place where he falters a bit is that last passionate appeal of his exhorting people to come support Bhaijaan. But by then, it’s all over. The others in support – Rajesh Sharma, Sharat Saxena, Om Puri, etc. are extremely well cast and right on the money. For a change, Salman decided to start off with a script this time. Or, maybe, Kabir Khan decided not to throw away the script in his excitement of having signed Salman for a movie which was getting an Eid release. One of the biggest positives of the movie – it’s neither preachy nor pedantic. Mostly. The movie has its flaws, the biggest of which is its ending, and the long standing gripe I have against the “need to conclude”. I don’t think there was a need for Shahida to get her speech. I don’t think it was important to have the army general drama about forcefully trying to prove Bajrangi a spy. I don’t think there was a need to apologetically convert a staunch Hindu Bajrangi and make him do an Allah hafiz slow-mo. More importantly, I don’t think there was a need to stretch the movie too long to accommodate all this. The music is not much to write about. Bhar de jholi meri + Adnan Sami is the high point. Selfie le re will always be the song that you don’t confess to liking, but are bound to hear on every radio channel 15 times a day, just because it’s so popular and catchy. Camerawork / DOP deserves some mention too. The opening shots, and some of the shots of Pakistan part of the movie (the corn truck scenes/ the sunsets, etc.) are beautifully shot. For some reason, the last shot of the movie, between the two borders, reminded me of Henna. The movie runs much longer than I would have liked. But the charisma of Bhai is such that directors always think more is better.